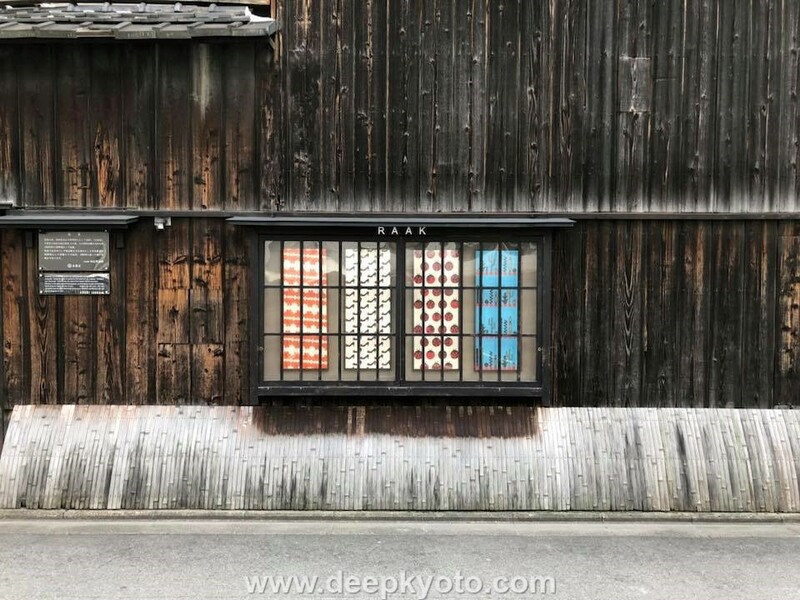 In this special guest post, our friend, Edward J. Taylor continues his Kyoto walking project; exploring both the historical and modern aspects of the city’s famous streets. 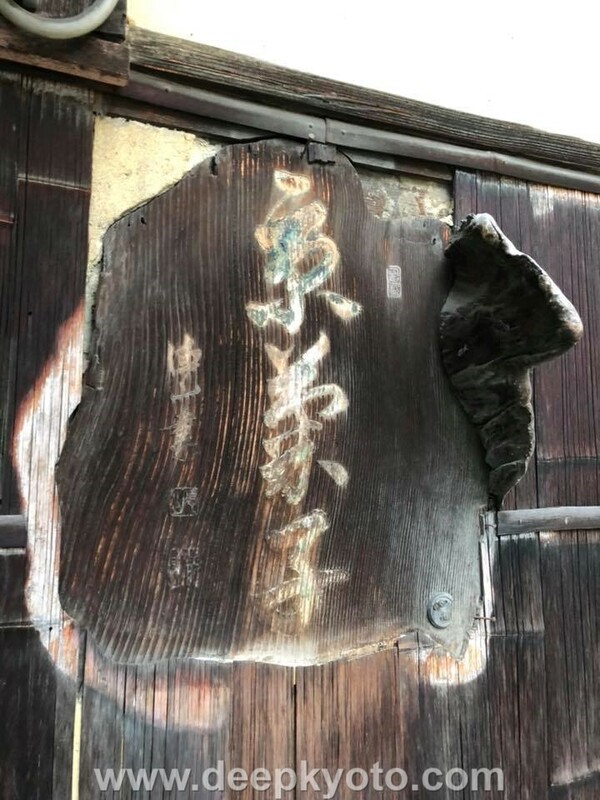 Today’s walk takes him along Muromachi-dōri; once just a pathway in the old capital of Heian-kyo, and today a busy street of restaurants and kimono shops, the way bears evidence of 1,200 years of cultural traffic. It’s best when doing these walks not to look up. 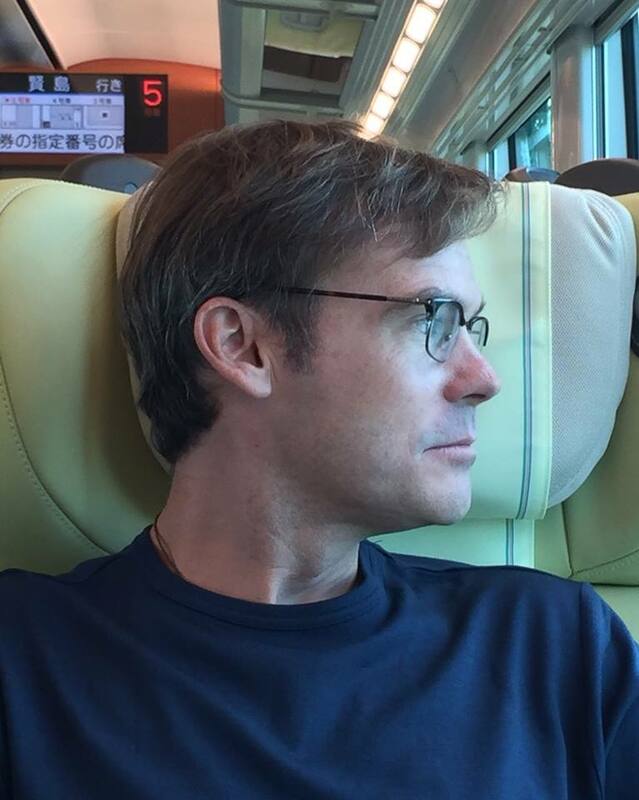 The first-time visitor to Japan is quick to mention the jumble of wires overhead. But the country seems to have recently found a way to safely bury their power lines, in this land of the seismic mambo. This internment has begun in the most heavily touristic spots, and the long-term resident finds it a little jarring when departing a train station in these places, as the mind grasps for what it is that looks a bit off, until realizing finally that what’s wrong is the unadulterated glimpse of sky. Kyoto has just begun this shift underground, but still lags far behind, and the downtown area still suffers a bit from visual blight. It is far better to look down for that is where you’ll find the unobtrusive landmarks: the stone stelae that denote a moment in history, or the minute perfection of tile and wood. At least during the middle stretches of Muromachi-dōri, the eye is deliberately forced upward, for this section takes on an unmistakably Christian theme. Little by little I had begun to notice this, as I often use this street for bicycle commutes downtown. The road was one of the first that came to mind when I first envisioned these walks. But when I arrive at the road’s southern limit below Jujo-dōri, the unattractive industrial neighborhoods make me feel like I don’t want to look at anything at all. Like on the previous walk, I begin under an expressway, but a small shift of a few meters brings me to the Kamogawa river. It has been straightened and covered in concrete, but in walking along the berm I can at least see the sky. The river of course marks a definitive start to Muromachi. The road’s true origin is a chop shop for fast-looking automobiles. I turn my back to it and point myself north, moving past tin-sided offices and light industry, and older apartment buildings past their prime. (The name of one of them, the Maison Blanche, goes a long way to prove this point, in a Streetcar named Desire kind of way.) I am moving quickly through here, believing in the promise of what lies ahead. A small park offers a blink-and-you’ll-miss-it patch of green, probably used mainly by taxi drivers as a place to pee. A few blocks to the west I again see the white cube of the Nintendo headquarters. A Buddhist temple further up looks to have been sawed in half in order to develop the space adjacent. To be completely honest, I find nothing of interest below the station, which should perhaps be a good indicator of where to begin walks in the future. The only thing that stands out is a trio of restaurants, of a type that in Japan are chosen more for economic reasons rather than as an attempt at a ethnically rewarding experience: a Korean joint; another one Chinese; and one of those barbeque places that grill up the more suspect parts of animals. Muromachi literally becomes the pedestrian flyover that brings you past the Isetan department store that props up half of Kyoto station. It is a day that promises spring, with temps of 22 degrees, but despite this, a number of people are walking around in heavy winter coats. I find myself wondering, as I always do, in just what climate did they awake. There are a surprising number of young women in kimono, and even more surprising in these days of no-holds-barred tourism is that they are actually Japanese. At this time of year, it implies a college graduation ceremony. I’m only a block north of the station when I find a new guesthouse in my way. And a block after that, the more immovable force of Higashi Hongan-ji. The temple’s side gates are no longer open, so I am forced to wrap around the grounds to the east. It is always worth a quick visit, mainly due to the Brobdingnagian scale of the place. Strolling the wide veranda you’ll find a number of things of interest: a diorama of workmen felling the towering trees used for the temple beams; a rope braided with the hair of female parishioners; and a nice view of the thatch covered gate, its chrysanthemum crest hinting at a passage reserved strictly for the emperor. Beyond the temple the streets begin to reveal the houses that are recognizably Kyoto, the machiya, affectionately referred to as eels dens since their frontages were purposely kept narrow so as to avoid the taxes levied on their broader cousins elsewhere. Sadly a number of these machiya have been outflanked by more recent constructions. I will admit however that some of these newer structures have been designed with a nod to tradition, in their conservative use of materials and subtle color scheme. The first real thing of interest on the day is a sushi shop, whose own frontage proudly displays not only plastic representations of their specialties, but also a sticker that boasts of their participation in the fight against O-157. Not far along is a cozy looking restaurant called “Gaudi,” which specializes in Japanese tapas. 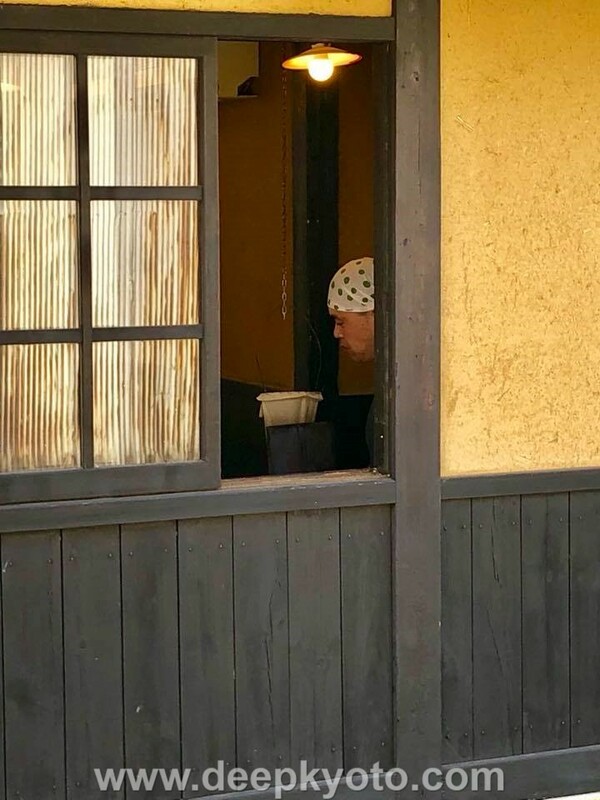 A tiny annex has been attached to the front, to form a tachi-nomi cantina that can’t possibly enable more than two or three to live la vida loca. As I continue along, I note that the restaurants here approach a balance between old and new (and far too numerous to mention). 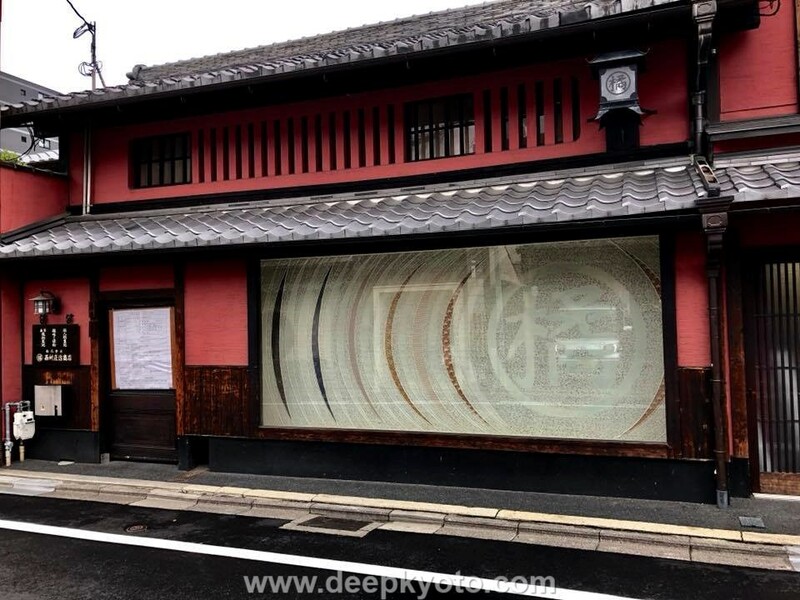 There is also an old kimono shop, with a fabric shop directly across. A lane to the right is lined with small izakaya. And of course there is the ninja dojo, where for 1000 yen the visitor can toss fifteen throwing stars, though at what is not stated. The price for children to have a go is half that, not counting the price for band-aids. A low, two-story tobacco shop stands on the corner of Shijo-dōri, hemmed in by giants. I’ve noticed this numerous times, and always imagine that somewhere a developer is sharpening his knives, as he counts the days until the owner’s passing. 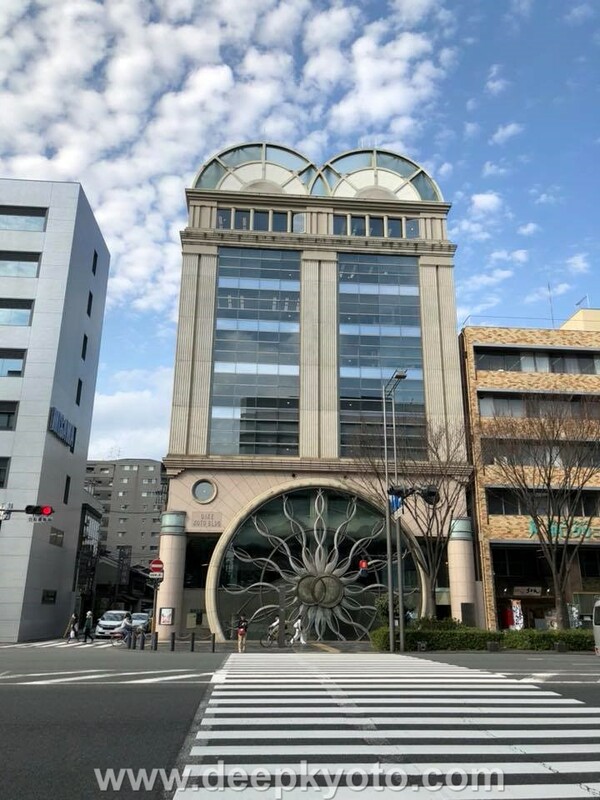 On the opposite corner, with no attempt of irony, is a shop called “Tree of Life.” It is the cornerstone to the WAON building, and one night I overheard this eponymous Japanese sound produced by a cluster of musicians practicing the jingly-jangly “theme song” of the Gion festival. Things take a turn to upscale past Shijō, in the form of a number of new, high-market flats, each an obvious attempt to tastefully blend with the neighborhood and subdue the ostentation as it were. Here too is the Kyoto Art Center, whose lovely campus mimics the 1869 elementary school that once stood on the site. The school offers a variety of classes and hosts numerous events through the year. Directly beside it is the Somé -Seiryukan, the world’s first museum dedicated strictly to dyeing. I marvel that up until this point, I had seen nothing remarkably old, nothing historic. Little surprise I suppose, this close to the city center. The irony here is that the oldest looking things were most often the newest. And it is just as I am thinking this that I come to the Koiyama Gion festival float. The name is a reference to an old Chinese tale of a carp that swam up a waterfall to become a dragon, an esoteric metaphor for the movement of spiritual energy up the spine upon attaining enlightenment. The float is well known for its 17th century Belgian tapestries of Homer’s Iliad, gifted by Pope Paul V to the mission of warlord Date Masamune. Another float soon follows on the next block, the Kuronushiyama, named for a famous Heian period poet. Over Oike-dōri now. The bulk of Muromachi’s history has been condensed into these next two blocks. Traditionally in Japan, craftsmen and merchants were organized into guilds. Due to centralized control, they were clustered in the same neighborhood. In the modern world, there is much more diversity (excepting perhaps, convenience stores), and now a variety of businesses operate along this stretch. Yet it is in their dense proximity that one is offered a glimpse of how it was in days past. A couple of houses on the corner have been built with sidings of real wood, a nice nod toward the old ways. Nearby, a Lions Mansion with its tell-tale lion statue, though this one has a cub, perhaps an appeal to its residents to help raise the birth rate. On another corner is the headquarters of the Maruki company, a grey concrete block most certainly not built upon the company’s founding 1921. Not far away is a small park marking the former grounds of an even more significant giant, Mitsui, whose move to Edo brought Japan its first department store, named Mitsukoshi. (Further significant as the first place in Japan that allowed people to keep their shoes on upon entry.) A bird rests in a blossoming plum tree nearby, as if to underscore the passage of time. Above Marutamachi, the aforementioned Christian section begins. The location makes perfect sense, paralleling as it does the Imperial Palace Grounds two blocks to the east. These sites once held the palaces of the Imperial Ministers, whose spacious grounds would have proved ample for the large churches and schools that rushed in to fill the gap left when the court moved to the new city of Tokyo in 1868. As the number of Christians in Japan has never risen above 1% of the overall population, we can argue that the effort proved more material than spiritual. 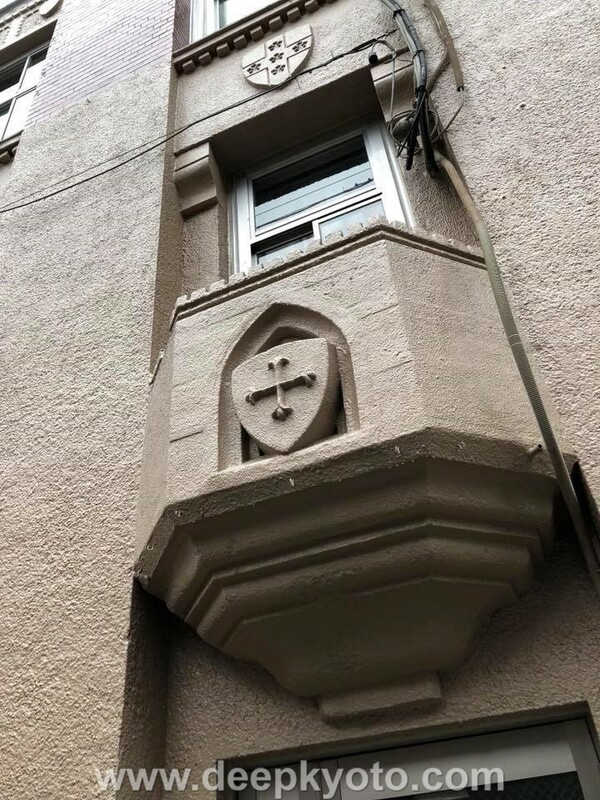 The most remarkable monuments are over on Karasuma-dōri (along the west border of the palace grounds), namely the Tudor style Daimaru Villa, and the fantastic buildings on the campus of Doshisha University, Japan’s first Christian college. 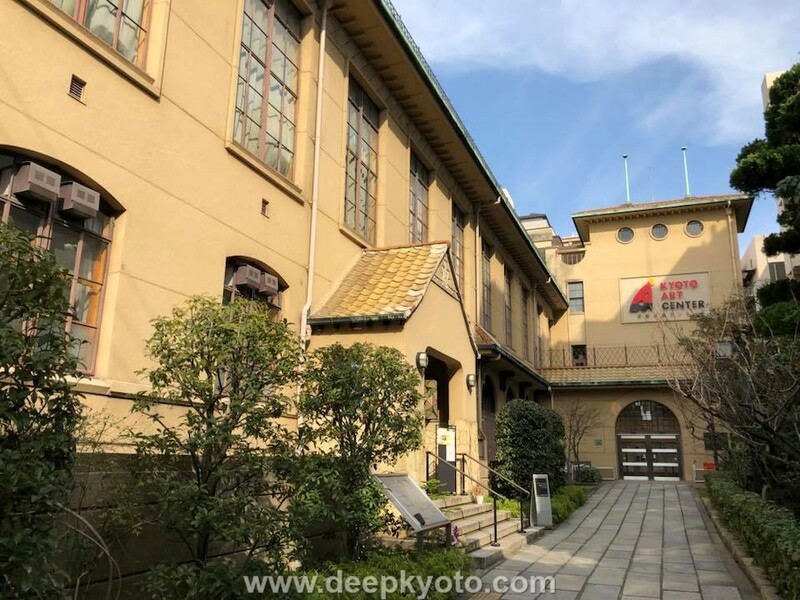 On Muromachi proper, the gem must surely be Saint Agnes High School and Heian Jogakuin University, twin structures built in 1875, whose affiliated cathedral on Karasuma-dōri is a magnificent study in brick. Formerly these grounds were the estate of the last Ashikaga Shogun, Yoshiaki, bequeathed in 1569 by Oda Nobunaga before he chased the shogun out of town four years later. 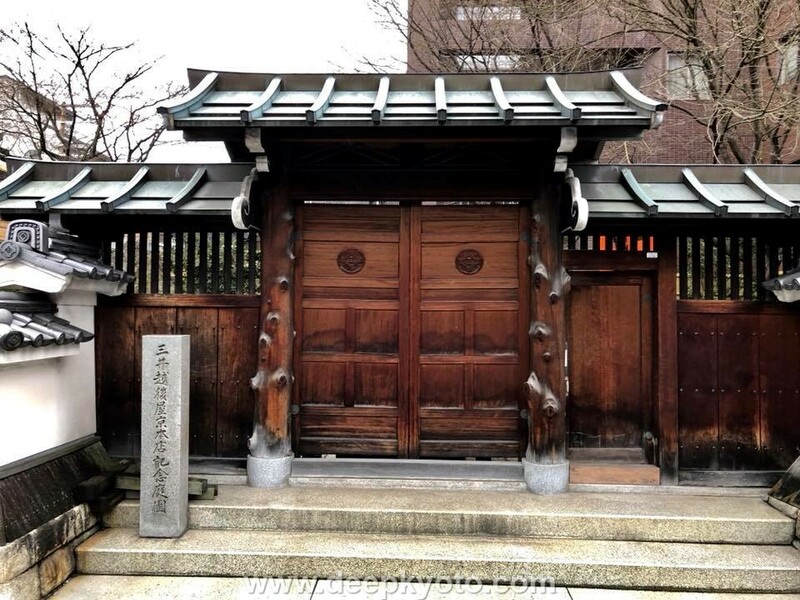 The reign of the Ashikaga is referred to as the Muromachi period, tidily giving us the name of today’s walk. 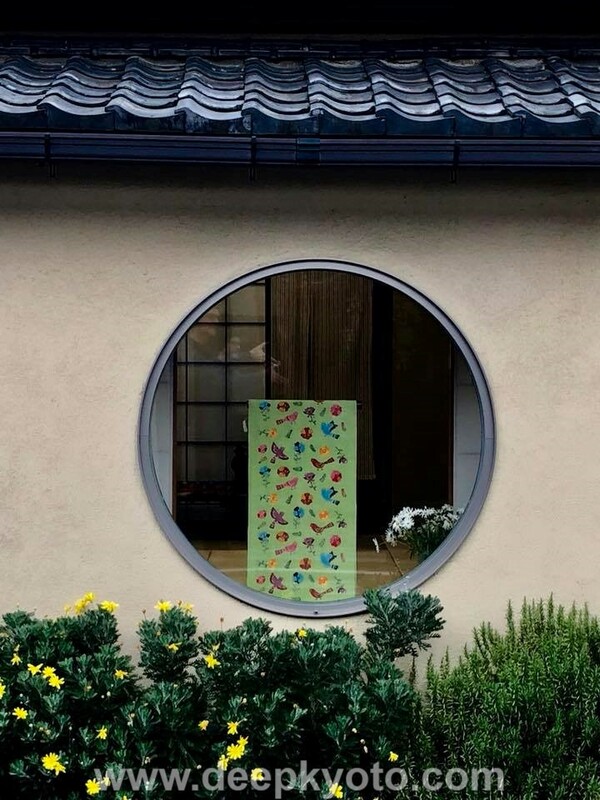 Not far off are a handful of churches, and the YWCA, which offers an array of classes, as well as a book exchange for Kyoto’s English speaking residents. Classes and lectures are also held at the nearby Fudenkan, a former Buddhist temple now a place of cultural exchange. The fusion of these new styles with the old would have been welcomed by Tomioka Tessai, whose last house was just up the road. He helped incorporate the western aesthetic into traditional Japanese motifs, ushering in the Nihonga movement. In perhaps the ultimate irony, a good many of these western themes had been incorporated from Japanese woodblock artists in the first place. And as the operations of cultural influence can reverse back upon itself, so too can the operations of the road. For some bizarre reason, the direction of one-way traffic along Muromachi now changes to a northbound direction at Teranouchi after having traveled southbound up to now (but for a similar reversal for a few blocks south of Gojō). Perhaps fusion is too difficult a concept for Kyoto’s traffic planners. The road from here is mainly newer homes, except for the obvious exception of the Meiji period Ikutani house, privately owned but which occasional offers tours. A nearby machiya of a similar age today houses a beauty salon, while another has been converted into the Toki Kuramaguchi, a pretty little holiday apartment. A stone marker a short ways up at Kuramaguchi marks the former location of a villa where samurai from the Satsuma clan conspired with those from Choshu to overthrown the Tokugawa Shogunate. Reputedly both Saigo Takamori and Sakamoto Ryoma visited here, and I can almost picture these two legends planning over coffee at the adjacent Prangipani Café, or noshing on Kyoto’s best gnocchi at Furuppu Café a few steps back down the road. The road continues from here for another kilometer or so, leading past little of interest but the innovative BebeCarty holistic baby care clinic, a pleasant gingko-lined stroll park along Shimei-dori, and the enviably spacious grounds of the Ritsumeikan elementary school. Finally at Kitayama, Muromachi-dōri comes to rest once again on the banks of the Kamogawa river. A wrap up doesn’t get much neater than that. Edward J. Taylor is a prolific walker, writer and editor based in Kyoto, Japan. In addition to co-editing the Deep Kyoto: Walks collection, he also keeps a regular blog of rambles at http://notesfromthenog.blogspot.ie/. Follow his adventures on his official Facebook page. Article and original photos by Edward J. Taylor. All rights reserved.